Renegade: must be the last character in play. 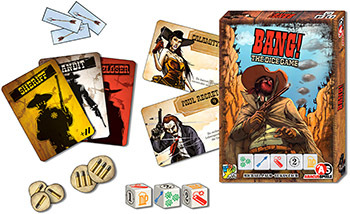 8 players: 1 Sheriff, 2 Renegades, 3 Outlaws, 2 Deputies. Shuffle the roles and deal one, face down, to each player. The Sheriff reveals himself by turning his card face up. All other players look at their role but must keep it secret. Shuff e the characters and give one face up to each player. Each player now announces the name of his character and reads his ability aloud. Each character has some special abilities, which make him unique. 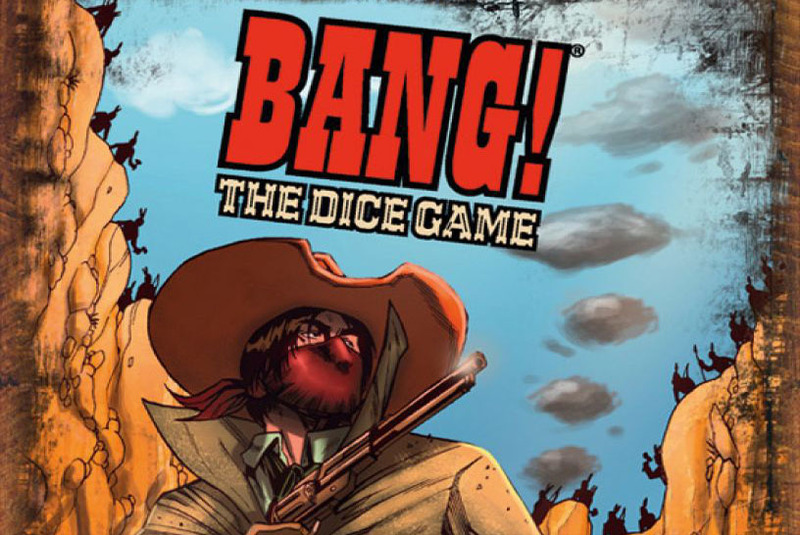 Each player takes a number of bullets as shown on his character card. The Sheriff plays the game with two additional bullets. The bullets you have are your life points-i.e., how many times you can be hit before being eliminated from play. Keep any remaining bullets in a pile in the middle of the table. Keep the summary cards handy. You can use them when you have a doubt about the dice results. Place the nine arrows in a pile in the middle of the table. Put the remaining roles and characters back in the box. The Sheriff takes the five dice and starts the game. You may then choose to keep the dice or re-roll some or all of them up to two times. If you roll a third time, you may also re-roll any dice you didn't choose to re-roll on your second roll. You must accept the third roll. When you are satisfied with your dice roll (or you're out of re-rolls), resolve the dice results. Your turn is over and play passes to the player on your left. Important: Any Dynamite rolled cannot be re-rolled (see below). Note: Any Arrows rolled must be resolved immediately after each roll (see below). Unless an ability says otherwise, when you gain a life point (bullet) or arrow, take it from the central pile. If you lose a life point or arrow, return it to the pile. You can exchange a three-bullet token for three one-bullet tokens from the supply at any time (or vice-versa). The dice show six different symbols. 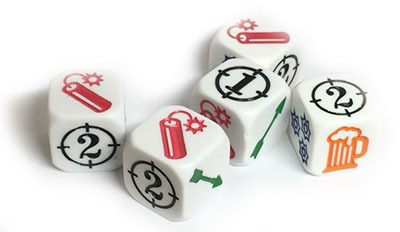 The symbols showing on the dice each have a different effect. You must apply all the dice results in the following order. You cannot pass on a rolled die: you must use them all! You must resolve this die immediately when rolled, not at the end of your turn. Take one arrow token (one per arrow rolled) and keep it in front of you. You may roll this die again if you have re-rolls left. If you take the last arrow, the Indians attack and each player loses one life point for each arrow in front of him. After the attack, all players discard their arrows, and you resume your turn. This die cannot be re-rolled! If you roll three or more Dynamites, your turn ends immediately and you lose one life point. But, all your other dice results are still resolved as normal. Choose the player next to you on your left or right. That player loses one life point. Important: and results are resolved at the same time. When counting places, do not include eliminated players. Choose any player: he gains one life point. You may choose yourself. You can never have more life points than the number you had at the beginning of the game. If you choose a player with his maximum life points, this result is wasted. If you roll three or more Gatlings you activate the Gatling Gun, and each of the other players loses one life point. Also, you discard all of your arrows. Example. The Sheriffhas 6 life points and 1 arrow. He rolls . First, he must take 2 arrows. But, there is only 1 arrow left in the pile, so he takes it and the Indians attack. Each player loses 1 life point for each arrow: the Sheriff loses 2. Now, everybody discards all of their arrows and then the Sheriff takes his second arrow (so there are 8 arrows left). He now has only 4 life points and 1 arrow. can't be re-rolled, and the Sheriff decides to keep and re-roll . This time he gets . He decides the Gatling Gun could be a nice idea, so he chooses to keep , and re-rolls and the kept after the first roll. He gets . Since he has re-rolled twice, he must stop rolling. His final result is: . He must now shoot a player sitting two places away, then all players except the Sheriff each lose one life point and the Sheriff gets to discard his arrow. At the end of his turn, he has 4 life points and 0 arrows. If you lose your last life point, you are out of the game. Show your role to all players and discard all your arrows. If you are eliminated, you do not act in the game anymore. But, if your team partners win, you win too! The Sheriff is eliminated: If a Renegade is the only one alive, he wins. Otherwise, all Outlaws win as a team. All the Outlaws and Renegades are eliminated: The Sheriff and all Deputies win as a team. Note: In an 8-player game, each of the two Renegades plays on his own, and wins only if he is the last player alive. 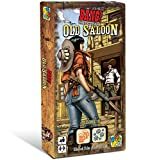 If, in the final stages of the game, the Sheriff is confronted by two Renegades and the Sheriff is eliminated first, the Outlaws win! Example: All the Outlaws have been eliminated, but a Renegade is still in play. In this case, the game continues. The Renegade must now face the Sheriff and his Deputies on his own. Example: The Sheriff is eliminated, but all the Outlaws were already eliminated and one Deputy and a Renegade are still in play. The game ends with the Outlaws winning! They achieved their goal at the cost of their own lives! Example: All players are eliminated at the same time. Outlaws win! the Outlaw must eliminate the Deputy. The game plays as usual, with the Deputy taking the first turn. You win as soon as you reach your goal if you cause your target to lose his last life point (e.g., as the Deputy you must personally eliminate the Renegade). Deputy did not win-he must now eliminate the Outlaw, who must in turn eliminate the Deputy in order to win. You may take an arrow instead of losing a life point (except to Indians or Dynamite). You cannot use this ability if you lose a life point to Indian or Dynamite, only for , , or Gatling Guns. You may not use this ability to take the last arrow remaining in the pile. You may re-roll (not if you roll three or more!). If you roll three or more Dynamite at once (or in total if you didn't re-roll them), follow the usual rules (your turn ends, etc)..
You can use as and vice-versa. When a player makes you lose one or more life points, he must take an arrow. Life points lost to Indians or Dynamite are not affected. If you have four life points or less, you gain two if you use for yourself. For example, if you have four life points and use two beers, you get four life points. You never lose more than one life point to Indians. For each you may discard one arrow from any player. You may choose to discard your own arrows. If you roll three , you discard all your own arrows, plus three from any player(s) (of course, you still deal one damage to each other player). You may make one extra re-roll. You may roll the dice a total of four times on your turn. You never lose life points to the Gatling Gun. Each time you lose a life point, you may discard one of your arrows. You still lose the life point when you use this ability. You may use or for players sitting one place further. With @1.jpg| you may hit a player sitting up to two places away, and with you may hit a player sitting two or three places away. At the beginning of your turn, any player of your choice gains one life point. You may also choose yourself. Once per turn, you can use a to double a or . The dice you double takes two life points away from the same player (you can't choose two different players). The in this case does not provide any life points. If you didn't roll any or , you gain two life points. This only applies at the end of your turn, not during your re-rolls. Each time another player is eliminated, you gain two life points. You only need to use the Gatling Gun. You can activate the Gatling Gun only once per turn, even if you roll more than two results.